Available to Order. Estimated delivery is 07/06/2019. The Yamaha CP73 stage piano is the smaller sibling of the fully-weighted CP88. Featuring the same incredible sound engine, controls, effects and connectivity but utilises a 73-note balanced hammer action keyboard that hits the sweet spot of incredible touch whilst remaining lightweight. If you need a stage performing machine that's portable, you should check the CP73 out! The CP73 is designed for the stage and has an interface that makes accessing all features of the CP73 quick and easy. Voice category buttons give you immediate access to your favourite sounds making changing voices mid-performance very simple. The large lighted buttons make it easy to split and layer sounds even in the darkest of venues, allowing you to switch from a full piano, to a piano voice layered with strings, or piano with a split bass sound. Seamless sound switching also means that the natural decay and release of a tone will not be cut when changing sounds, making your performance sound totally organic. The Yamaha CP73 features a freshly designed, 73-key balanced action that gives you that authentic electric piano feel that's so satisfying to play. It even features an “E-to-E” keyboard – perfect for playing in a band suited to guitar and bass arrangements. Balanced action is useful when playing a variety of sounds from acoustic piano to organ or even synth and is one of the most popular "feels" a keys player can have in a keyboard. To polish and personalise, the CP73 comes with a full digital effects processor built in. Reverbs ranging from small rooms to massive halls, rich choruses, compression, EQ and an array of insertion effects can be layered onto your sound and stored for later use in any of the 64 user performance memory allocations. A 3-band EQ is also built in allowing for you to tweak the timbre to your exact specification. Control and connectivity are key to any performer and above the keyboard, you'll find pitch-bend and modulation levers, all manner of logically laid out encoders to alter the volumes, effects and timbre of multiple voices and a clear LCD screen to display any vital info. The CP73 has connections for 2 foot controllers, MIDI and USB MIDI and storage. For audio, there is a pair of 1/4" jack outputs and for quiet playing and practice, there's a headphone output too for when quiet practice or monitoring is required. 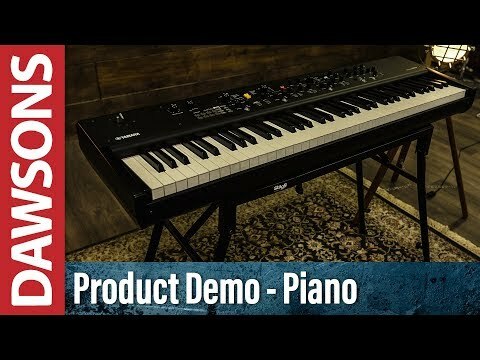 The Yamaha CP73 Digital Stage Piano is nothing short of incredible. For the musician that needs authentic piano feel, and incredible sound engine but still needs something portable, the CP73 is a must.